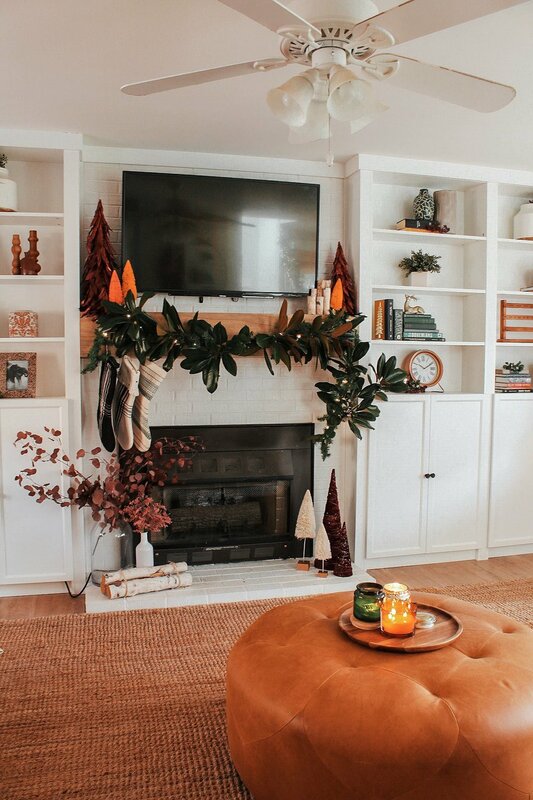 Our goal for this holiday season changed a bit from last year in that I wanted to create a festive cozy environment but still compliment the existing aesthetic. In years past, I felt as though I had to pack everything away and make room for Christmas. This year, I just wanted to bring Christmas IN to what was already happening in our home without any clashing and I didn’t want to over do it. For example, our printed curtains weren’t around last holiday and I knew there was no way I was taking them down for a month. I didn’t think a traditional green and red theme would’ve complimented them as well, and what’s the fun in that? So in efforts to make our holiday feel as cohesive and effortless as possible, we set out for some new challenges. We decided to go flocked for our big tree this year. I was weary at first - I used to hate flocked trees. Growing up we always went out and picked a real tree, usually 12 ft tall if I got my way. I thought flocked or any store bought were tacky and way too artificial looking. I’ve either had a massive change of heart or they’ve come a LONG way. Whichever it is, I think it looks so fun and eclectic in our space. We got this 7.5 King Flock, unlit from King of Christmas for an amazing 50% off. We opted for funky inexpensive bulbs from Hobby Lobby, World Market and Target including PB&J’s, lemons, converse sneakers, gummy bears and crystal ornaments. I decided to run three strands of eucalyptus garland throughout as well as gold beaded strands and topped with my favorite: a glittery gold deer head. 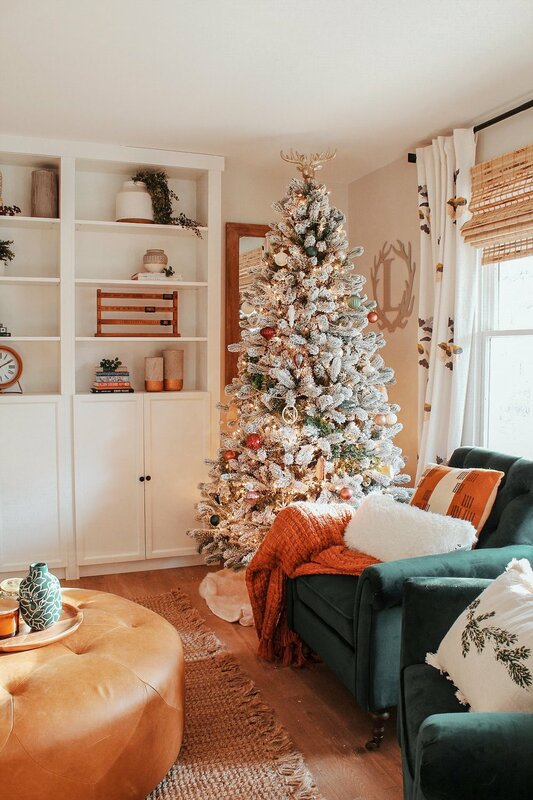 We won’t discuss how I already had our dark green tree in here done and decorated but decided to take it down and start over because “something didn’t feel quite right”… yup. I did. And it was so worth it. This one looks so much better against our green chairs and curtains and fits the space so effortlessly. 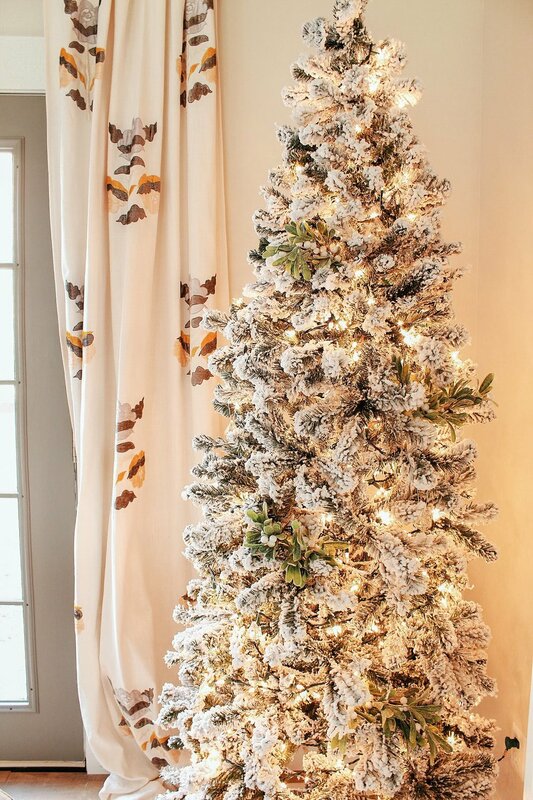 Finishing it off with a faux fur white tree skirt I dug out of storage from years ago was the icing on the cake to this “Anthro on a budget” inspired tree. 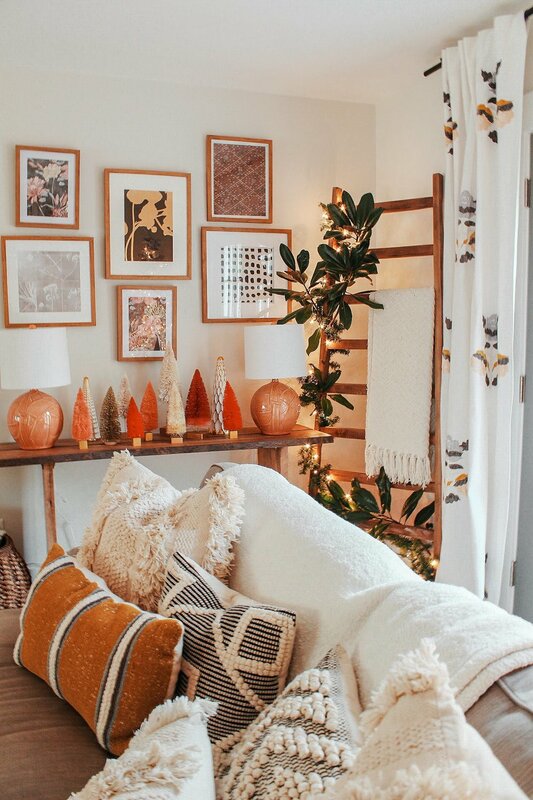 We’ve got a lot of orange and rust happening in our home as of this last year so I took a chance and decided to try and make “orange Christmas’ a thing. We found tons of bottle brush trees at Hobby Lobby for crazy low prices and these beautiful feathered burgundy ones as well. 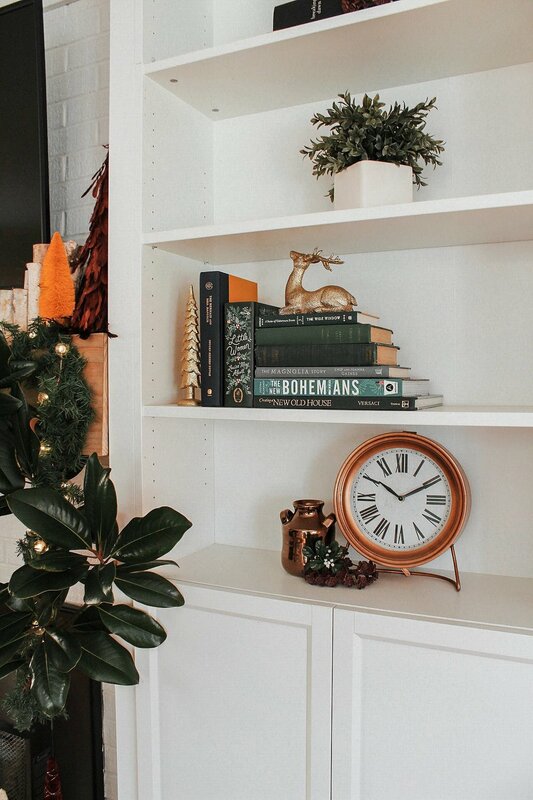 Our DIY Magnolia Garland adds a funky unique but still festive vibe to the space. I also decided to carry over our dried eucalyptus stems from fall, they transitioned well with the cranberry, burgundy and rose tones. I strongly feel that twinkle lights are the best part of Christmas decor and they should be used as much as possible. These little battery powered ones intertwined in our logs were only $5 from Target. As for tree number two we decided to keep it pretty bare - I ran some eucalyptus through it and added a few of the crystal ornaments to mimic the large tree but I’m loving the simplicity of her simple and soft glow. At least, that’s what my husband calls it. Give me all the bottle brushed trees. Seriously. I’m so obsessed with this little table set up. It’s like a little simplistic forest of funk. It also looks very natural with our lamps and gallery wall, so mission accomplished. We ended up moving our blanket ladder over to this corner to accommodate the other tree and I cut a little too much magnolia and decided to do another garland here rather than waste it. This also balanced out all of the lights in the room and creates a nice even glow throughout in the evenings. For our built ins I wanted to keep our typical decor on them, so we added in small pieces of mistletoe throughout and little pops of gold reindeer and trees. It’s just enough to add the feeling in without changing too much. Boone is clearly unsure about that red box and it’s intentions.. (yes he was literally staring at it and growling, our dogs are crazy). I love taking non traditional understated garland and making it festive. We took your everyday eucalyptus garland, added lights and snowy pieces of pine cones and evergreen to make it look more wintery. If you’re wondering how we secured it to lay on top of the banister - clear zip ties are your best friend. We attached about two going down the handrail and one around the base post. I like to incorporate the entire house this time of year. I spend so much time in the kitchen, even more so this time of year and I want to enjoy the feeling of Christmas as much as possible. 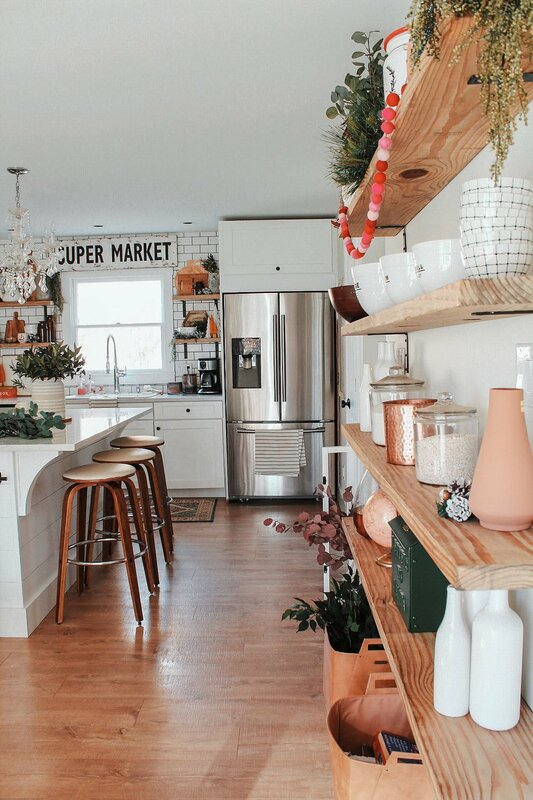 We kept it simple by updating the shelves with small details and adding in wreaths . A cute Christmas mug, adding snowy pieces into our existing greenery, a few bottle brushed trees was really all it took. 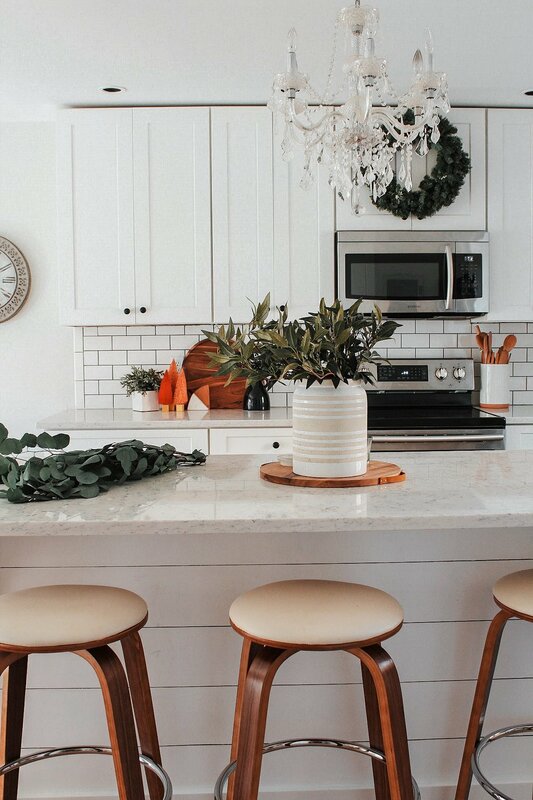 Our DIY range hood didn’t make the by Christmas to do list, so we just opted for a wreath above the microwave. I grabbed some branches from outside and spray painted them gold for run of the table. However Bobby gets full credit for the over the door way decor. It’s just two fir stems tied together with some mini bulbs in the middle. He came up with it on his own (as a joke) and I thought it was perfect. 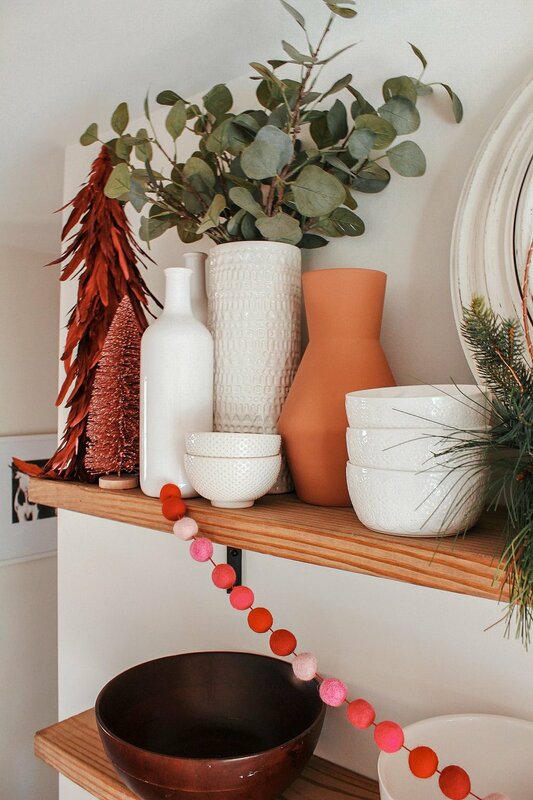 Something about felt garland makes my heart so happy. I picked up this pink and red one from World Market and it goes great with the Burgundy and rosy colored trees. I bought this “half of a wreath” as Bobby calls it from Target and after walking around the entire house 3 times with it, I plopped it here and all felt right. We bought the letters to Santa box from the Hearth and Hand line last year and couldn’t wait to pull it out again (it’s available this year too!) And lastly, probably the most traditional of my current decor but you just have it have it: a good Christmas cookie jar. We have a secret family Christmas cookie recipe that get’s a lot of requests this time of year and I basically turn into a cookie making machine Thanksgiving - New Years. It’s one of my most distinct memories from my childhood holidays so there’s something very sentimental in my heart for them. The red dress is not decor, but we may or may not have photographed Christmas photos while I was wearing it. Bobby hung it here and we were loading the dogs in the car and I just thought it looked too pretty with the decor not to snap a photo. Remember what I said about incorporating the whole house? That means our bedroom too. In my defense, I work really long days M-F and go to bed embarrassingly early on weeknights, so in order to get in my festive time in it’s kind of necessary. I added a stack of little trees on my dresser, I left Bobby’s bare because he’ll destroy it with pocket knives, change and receipts in minutes.. and we totally added a third tree, because of course. This wreath has been on our door all year, so I just added some fun copper bells to make it look in season. We framed our front stairs with our DIY Magnolia Garland and a two trees I made out of tomato cages and garland.